The National Youth Secretary of the New Patriotic Party (NPP), Mr Isaac Asiamah, has described the actions, utterances and comments of Mr Kofi Wayo and Dr Tony Aidoo, leading members of the PNC and NDC respectively, and the presidential candidate of the GCPP, Mr Dan Lartey, as comic relief. 'Never mind them, they are political gimmicks. They are in the system to provide comic relief to calm tempers when political tension mounts high', he told the press. Mr Asiamah said this in reaction to Mr Wayo's pronouncement that he and the PNC could solve 70% of Ghana's economic woes within 18 months, when given the mandate. He stated that politicians of Mr Wayo's nature have nothing good to offer Ghanaians than to exploit the little resources in the country at the expense the poor taxpayer. 'He has no vision for the nation; he is just a talkative. It is the PNC that will cheapen itself for people like Kofi Wayo', he said. It emphasized that people like Mr Wayo would not get any chance in the NPP to crack jokes in the name of the party whilst serious people are ever ready to sacrifice for the party and the good people of Ghana. 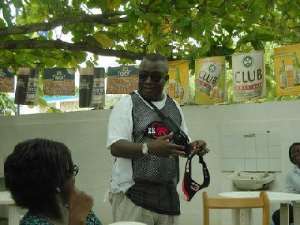 Mr Asiamah, also an NPP parliamentary aspirant in the Atwima Mponua Constituency, disputed Mr Wayo's assertion that the leader of the PNDC, Dr Mahama, being a medical doctor, would be more vigilant in handling the economy of Ghana since that profession calls for precision and vigilance. Earlier, Mr Wayo had made those pronouncements at the annual week celebration of the Northern Students Union (NSU), Sunyani Polytechnic chapter, over the weekend. Mr Wayo asked the members of NSU to influence their people back home to assist the PNC to unseat the 'elephant party' come the December elections.